Inspired by a Sunset Magazine recipe. Tonight I needed a nourishing yet detoxifying dinner with absolutely no meat involved. I found this recipe in the January 2013 issue of Sunset Magazine and adapted it to fit my taste. It was delicious, I highly recommend this vegetarian recipe as a dinner option! Throw all the mushrooms in a pot with the broth, add water to almost reach the top mushrooms. Cover and bring to a boil. Reduce heat and simmer until mushrooms are almost tender. Add the bok choy, ginger, jalapenos while simmering. Stir in the vinegar, Sriracha, sesame oil, and fish sauce. Squeeze in the juice of 1/2 to 1 lime. Add vinegar, fish sauce, Sriracha sauce to taste. Top with green onions, serve hot. So easy, so satisfying, so delicious! I was in NYC visiting my cousins and came back with… how do you call it again?… Ah yes, a MUFFIN TOP. I am in major need of a detox and put together this recipe that would satiate me, satisfy me, and purify me all at the same time. Put 1 quart vegetable stock + 1/2 quart water into a pot, bring to a boil. Throw in the mushrooms, kale, parsley, cilantro, chervil, mint, ginger, simmer for 3 minutes. Add the prawns and simmer until the prawns are cooked (pink). Remove from the heat, add the scallions, the juice from the lime, coconut vinegar, fish sauce, soy sauce, and Sriracha. Eat hot and enjoy the detoxifying effect! This is a dish I made on a Sunday using all the amazing rhubarb I have been receiving through my Farm-to-Table service. I had never incorporated rhubarb into savory dishes before, but rather always made it into a sweet and tangy compote, so I was excited to try something new! Recipe, courtesy of Cooking Light with a few amendments by yours truly. Prep: 20 min. Cooking: 45 min. - Pour boiling water over lentils in a bowl to cover them. Let stand 10 minutes. - Pour some olive oil in dutch oven over medium-high heat. 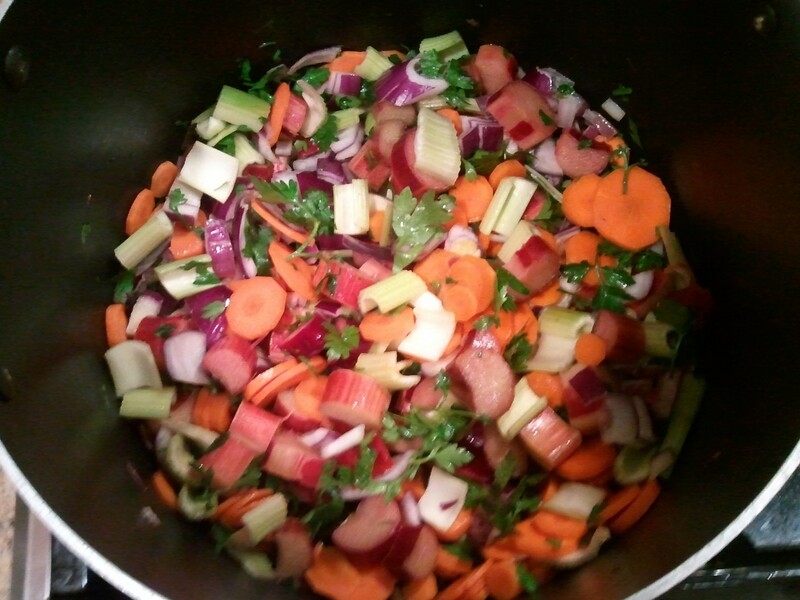 Add carrots, celery, onion and parsley, saute for 5 minutes. Add rhubard, saute for 3 minutes. Drain lentils, add to the rest. - Stir in broth and salt, bring to a boil. Cover, reduce heat and simmer for 35 minutes, until lentils are tender. If the liquid reduces too much, add 2 to 3 cups of water. I personally like my soups not too thick. - Remove from heat, let cool. Pepper to taste. Cooking Light’s recipe says to blend 3 cups of the lentil mixture, then to add the blend back to the pan. I say there is no need, just enjoy it as is. Add a dollop of creme fraiche in your bowl if desired, enjoy!